I have never been much of a costume person. 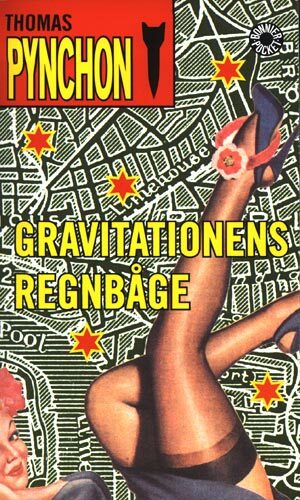 But it was time for our final party – our celebration – of the group that started on January 2 of this year – to read, together, Thomas Pynchon’s ridiculously difficult book, Gravity’s Rainbow. After that much work (not only reading the book, but taking the train to Bishop Arts every Wednesday after work for three months) I wanted to celebrate. I wanted my trophy. And it was to be a costume party. So I spray-painted a three dollar straw hat to simulate a White Stetson, bought a brace of dollar store dart guns to simulate a pair of 45’s, and put on an old army uniform top… and I was Major Marvy – one of the most odious characters in the book. He did come to a very, very bad end, after all. I packed the getup into a paper shopping bag and headed out across the city to The Wild Detectives on the DART train. The party was fun. One woman wore a cardboard basket with a large helium balloon floating over her head and carried fruit pies – she won the costume contest. There were a couple Pointsman in white lab coats carrying stuffed dogs (one guy applied some paper saliva to his dog) and two Brigadier Puddings. A lot of Hawaiian shirts, harmonicas, toilets, bananas, and octopi (named Grigori). One rocket, serial number 00000. And I got my trophy. 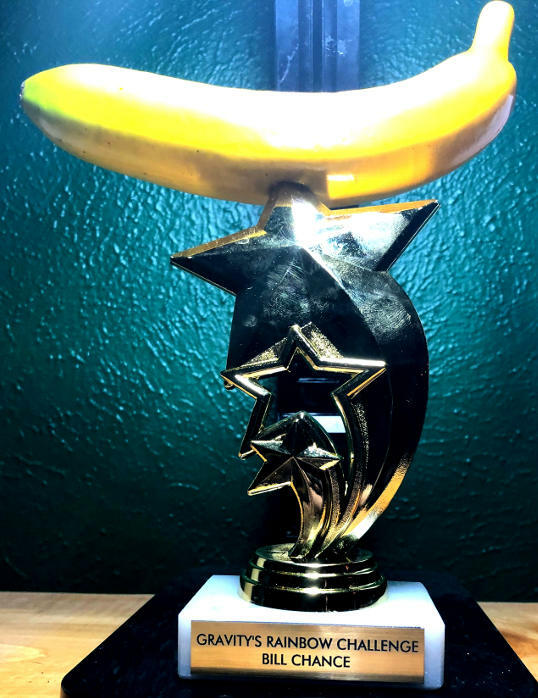 Trophy from the Gravity’s Rainbow Challenge. Yes, I read the whole thing. We took turns giving a short summary of our opinions of the book and reading a short quote. Two people (including me) thought the book was great. A handful came to like the book as they came to accept its weird and unique nature. The majority didn’t like the book, but enjoyed the process of reading it, especially in a group. A few absolutely hated it and wished they had never read it (which I, although I disagree, can fully understand). I asked one person that hated it with a passion what their favorite book was and they said, Harry Potter. If that’s your favorite book, you will never, ever like Gravity’s Rainbow. One eagerly awaited part of the party was the announcement of the next book in the Difficult Book reading series (they have already tackled Infinite Jest and Ulysses before Gravity’s Rainbow) which will start in September. In a bit of a departure, the choice is a Trilogy rather than a single book. It’s the “St Ives Trilogy”by Virginia Woolf – Jacob’s Room, To the Lighthouse, and and The Waves. I think I’ve read one of these – though it was a long time ago and I don’t remember very much. These aren’t books I’d ordinarily read – but that’s the point of a group like this, isn’t it – so I’m probably going to do it. If you’re interested (remember, it isn’t until September) get with me. And a Soul in ev’ry stone…. This entry was posted in Books and tagged books, gravity's rainbow, major marvy, reading, reading group, the wild detectives, thomas pynchon, to the lighthouse, trophy, virginia woolf. Bookmark the permalink.